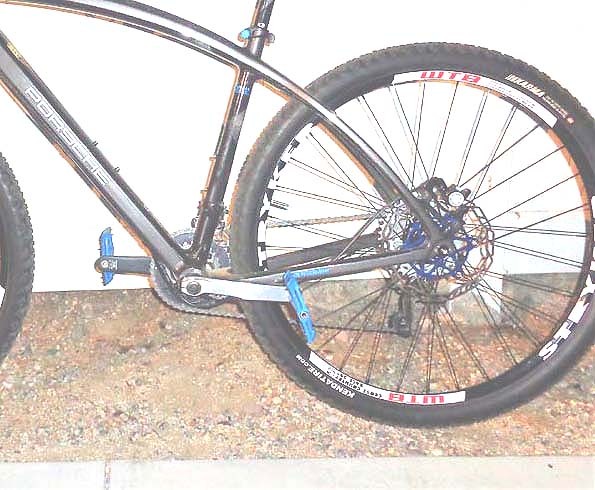 At some point i've noticed some kind of a strut under the rear brake mount of this bike Mongoose | Tyax 27.5 Comp. My bike doesn't have one. I'd like to know if this is a real necessity which keeps my rear triangle from breaking or just a marketing thing? Of course, but i'm curious. Anyway thx for response. That has nothing to do with the brakes, its just a frame design. Here's a pic of my carbon fiber $7,000 hardtail , notice the rear triangle doesn't have that thing you call on a 'strut' on it either. And thats a 203mm rotor. Oh my. Looks good! It's a carbon frame though, hence stiffer, i guess. But you convinced me not to worry about this problem. Note difference in the way the seat stay joins the chainstay at the rear dropout on the two bikes. The junction looks flimsier on the bike with the brace, possibly necessitating the brace. Of all the things to worry about on a mongoose, that's not one. ^^^ I'm sorry, but that made me laugh. Close. More like the weather reporter standing in the hurricane in this case. Yes it has. That's why the strengthening rib is only on the brake side. My guess is that if it was totally unnecessary they would not have bothered adding it. What type of rear disc brake mount for Nickel?